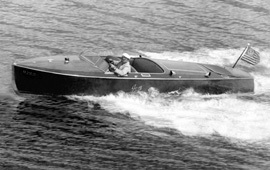 Antique power boat riding across the Long Island Sound, historical B/W photo digitally restored and printed on museum quality paper. The prints that you order are produced with the latest state of the art technology and will give you a life time of satisfaction....in fact, the prints will last a couple of life times if kept in a proper environment of low humidity and subdued ultraviolet light. Titus Kana produces each photo on an Epson Stylus Pro 4880 utilizing ultrachrome inks in his NYC studio. 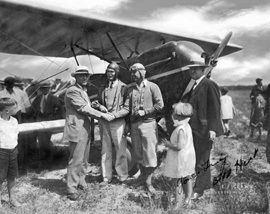 Historical photograph of the first air mail delivery to Fire Island, restored and printed. They are carefully mounted on a specially coated archival foam board which has a plastic barrier on the back to prevent moisture from leaching through. The best archival mats are used and each print is sealed in a moisture proof clear acetate sleeve for protection. The artist has selected the finest frames to show off your artwork and does not offer cheap metal or Walmart frames.The barn wood frames give the prints that rustic feel and really go well with images that have boardwalks and trees in them. Old photo of the first and only Air Mail Delivery to the Fire Island. The whitewashed and black gallery frames give the prints that classic feel and look beautiful in your apartment or formal home environment. Heavy 1/8 inch plexiglass and quality hardware is used to complete the frame. Any frame can be specially ordered upon request. The artist offers hand made panorama frames for the larger sizes prints. They are cut and assembled from raw cedar planks and then stained to match the tones of the image. You may also request a stain of your choice.